Welcome to recovery week! Once you reach week five, it is time to give your body a little break to recover. You will be performing core cardio and balance for six days in a row. In addition, if you purchased the standard Insanity package (as opposed to the deluxe package) you will also be performing this workout a couple of times throughout month two. I have compiled a full exercise list for this workout below. Whether you are trying to decide if you should buy Insanity, you’ve already bought it and are getting ready for recovery week, or you are just curious, I have tried to include every detail you could possibly ask for below. If you have any further questions, please take a minute to contact me and I will do my best to answer them for you. 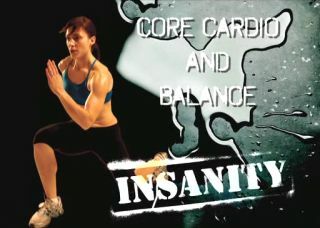 If you are ready to take the Insanity challenge today, click here. In total you should set aside about 40 minutes for this workout. As I mentioned, this specific routine is performed primarily during recovery week. Don’t let that fool you though, it is still quite challenging. Even so, I found core cardio and balance to be very slow-paced and somewhat boring when compared to the workouts performed over the previous month. It begins with a warm-up that is a bit different than what you will have grown accustomed to by now. You will be performing switch heel kicks, mummy kicks, football shuffles, over the log jumps, high knees, power jacks, fast feet and hooks. Moving ski hops – start by hopping to your left four times, with your feet together and knees bent. With each jump swing your arms as if you are propelling yourself down the mountain with ski poles. Repeat to the right. Hit the floor – we have performed this in previous workouts. As a reminder you will be jumping from left to right reaching high into the air as you do, bending down and touching the floor between your legs as you land on each side. Level 1 drills – this is also a move you should know by now. Start upright, drop to the floor and do a number of push-ups followed by a number of floor sprints. Return to an upright position and jump into the air. Repeat. Heisman’s – performed in practically every warm-up in this program. This exercise is kind of like a wide jog-in-place, bringing your knees up to your chest as you go. Switch kicks – jump back and forth from right leg to left leg, using your core to list the opposite leg into the air as you do. Hop squats – starting from a low squat position, hop up and down sinking into the squat as you do. High jumps – begin in an upright position, bent over slightly at the hips with your arms at your sides. Swing your arms forward and upward jumping as high as you can along the way. Moving plank walk – from a plank position, coordinate the movements between your arms and legs to perform a sort of sideways walk. Elbows – from an upright position with your legs set wide and your hands near your chest, swing your elbows forward in a punch-like motion. Suicide drills – run from side to side, reaching down to touching the floor as you reach the furthest point on each side. 4 & 4 hops – start on your left leg with your right leg in the air so your thigh is parallel to the ground. Hop four times and then switch legs. Repeat. Jab switch jump squats – jab your fists forward from a squat position eight times. Jump into the air and rotate 180 degrees and repeat facing the opposite direction. Hip flexor burners – from an upright position, bring your fists up near your face and your elbows in. Bring your left knee up so that your thigh is parallel to the floor, return it to the ground and tap your toe to the floor. Repeat a number of times and then hold your knee at the top and pulse. Repeat that motion a number of times and then hold your knee at the top and extend your foot. Switch legs and repeat. Oblique knee lifts – from an upright position in a wide stance, bring your left arm up over your head on the side. Lift your left knee up to the side as high as you can to try to meet your elbow. Repeat a number of times and switch sides. Shoulder burners in plie – begin in a squat position with your knees and feet in a slightly open position. Bring your arms out to either side, parallel to the floor. Pulse your arms up and down. Repeat a number of times and then start to swing your arms from side to front. Repeat that motion a number of times and then swing your arms upward from your side to meet at the top. After repeating that motion you leave your arms out to the side and roll them, alternating between a backward and forward roll. And then as they all do, cardio power and resistance ends with a few minutes of cool down stretches and breathing exercises. As I mentioned above, this workout goes at a fairly slow pace when compared to the others. I actually found it (and the whole recovery week) to be pretty boring… Except for when we got to the hip flexor burners and then the shoulder burners shortly after. Those are KILLER! All that said, I understand the need at this point for a more mellow workout to allow your muscles to recover a bit. It is very important that you stick to the schedule and take this week to recover. Hopefully you found this description to be useful. If you are ready to purchase the Insanity workout today, click here. Otherwise, please continue reading about the other Insanity workouts by following the links below.